Nobody suffered more humiliation and ridiculed in 2017 than Miss Valentina Nana Agyeiwaa Aka Afia Schwarzenegger, the controversial show host and self-acclaimed Queen of Comedy in Ghana. In September 2017, videos and photos went viral on social media. 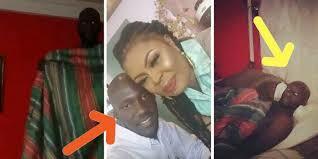 In the video, a nakked Afia Schwarzenegger was in bed with another man and the husband of Afia, Mr. Lawraence Abrokwah entered the room unexpectedly threatening to pour acid on Afia Schwar for bringing another man not just into their house but also sleeping with him on their matrimonial bed. Luckily for the mysterious guy, the room was dark, he is dark in complexion and he had a blanket covering almost all his body so Ghanaians never discovered who he was but we now know. In a new video just shared by Afia Schwarzenegger, she has introduced the guy she was caught in bed with by her husband leading to their divorce.